Living Science Solutions for Class 7 Science Chapter 5 Heat And Its Effect are provided here with simple step-by-step explanations. These solutions for Heat And Its Effect are extremely popular among class 7 students for Science Heat And Its Effect Solutions come handy for quickly completing your homework and preparing for exams. All questions and answers from the Living Science Book of class 7 Science Chapter 5 are provided here for you for free. You will also love the ad-free experience on Meritnation’s Living Science Solutions. All Living Science Solutions for class 7 Science are prepared by experts and are 100% accurate. This is because heat can be converted into other forms of energy, and many other forms of energy can be converted into heat energy. For scientific work, the ________ temperature scale is used. For scientific work, the Kelvin scale is used. There is no negative numbering on the Kelvin scale, as molecules cannot move or vibrate at temperature. The apparatus commonly used in the laboratory to show expansion on heating is the ring and _________ apparatus. 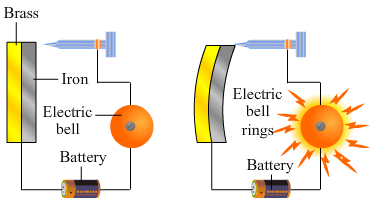 The apparatus commonly used in the laboratory to show expansion on heating is the ring and ball apparatus. In this experiment, the ball cannot pass through the ring due to its expansion, but the same ball can pass through the same ring when it is cooled down. Because M1 contracts more than M2 on cooling, M1 will also expand more than M2 on heating. Hence, the strip will bend towards M2. The negative sign implies that in the Fahrenheit scale temperature decreases by 18oF. Temperature is measured by expansion on heating. Expansion in which of these is most commonly used? Since expansion in solids are minimal compared to gases, measurement of temperature can be done easily through the expansion in liquids. Because heat is a form of energy, it can flow from one object to the other. However, temperature cannot flow from one object to the other. A cold object contains minimal heat energy as compared to our body, so when we touch a cold object, heat from the higher energy content region, i.e., our body, flows to the lower energy content region, i.e., the object. You are planning to go to a very cold place where the night temperature drops to -50 °C. Which thermometer will you take with you−mercury of alcohol? Why? To measure the temperature of cold places where the night temperature drops to -50°C, we will use the alcohol thermometer. This is because alcohol freezes at -115°C, while mercury freezes at -38°C. Give one example where expansion on heating is put to good use. Explain the working with the help of a labelled diagram. Automatic fire alarm is an example of expansion on heating, which is put to good use. The fire alarm works on the principle that different solids expand differently when heated. An automatic fire alarm consists of a bimetallic strip which have two different metals strips, iron and brass, bolted together firmly. Brass expands more than iron on heating. Therefore, when fire will reach this bimetallic strip, the brass will expand more thereby bending it towards the iron strip. Due to this bending of the strip, the circuit for the electric bell is completed and it starts ringing as the fire alarm. Once the strip cools down, it will return to its original shape, i.e., straighten up to break the circuit and stop the alarm. Explain why gases expand more than liquids and solids. Gases comprise loosely packed molecules as compared to that of liquids and solids. Therefore, when the gases are heated, there is a huge vibration in their molecules, thereby increasing the average distance between them. In case of solids and liquids, there is a strong bonding between their molecules; therefore on heating, these molecules vibrate but less comparatively to gases where the bonding between molecules is almost nil. Hence, in solids and liquids, expansion will take place but less than gases. A solid is heated from 0° to 100°C. Its volume increases from V1 to V2. It is now cooled to 0°C. Will its volume at 0°C be V1 or V2? At 0oC, the volume of the solid will be V1 again. The molecules of solids are tightly packed. Therefore, on heating to 100oC, the molecules just vibrate at their specific positions, thereby increasing the volume. Once the solids are cooled back to 0oC, the molecules stop vibrating, thereby returning to their specific positions. Which of these expand the most on heating−solids, liquids or gases? On heating, gases expand the most. Because the molecules of gases are not bound to each other, the vibration of molecules increases when gases are heated. This increases the average distance between the molecules, resulting in their expansion. In liquids and solids, molecules are bound to each other and restrict the expansion as compared to those in gases. All solids expands by the same amount when heated through the same temperature increase. True or false? False. Different solids have different arrangements of molecules; hence, their molecular bonding will also be different. This brings a difference to the amount of expansion in different solids at the same temperature. If overhead electric cables are being laid in summers, should they be tightened up, or left a little loose? If overhead electric cables are laid in summers, they should be left a little loose. This will save the cables from tearing when they start contracting in winters. Which is the correct formula: F = (95)C + 32 or C = (95)F + 32? The correct formula is F = (95) C + 32. It is used to convert temperature on a Celsius scale to temperature on a Fahrenheit scale. Temperature is usually measured by measuring expansion in gases since gases expand the most. True of false? False. Temperature is usually measured through the expansion in liquids. Gases expand the most; therefore, they fail to give the correct reading. Again, solids expand the least; therefore, they too fail to give the correct value of temperature. What are the upper fixed points of the Celsius and the Fahrenheit scales? The upper fixed point of the Celsius scale is 100oC, at which pure water starts boiling. On the Fahrenheit scale, the upper fixed point is 212o F, which is equivalent to 100oC on the Celsius scale. A ________ thermometer is used to record body temperature. A clinical thermometer is used to record body temperature. The range of temperature in the thermometer varies from 35°C to 42°C. Outside this range of body temperature, no human can survive. Which is greater−a 1° rise in the Celsius scale or a 1° rise in the fahrenheit scale? 1° rise in the Celsius scale is greater than a 1° rise in the Fahrenheit scale. It is shown in the calculation below. Hence, for the same temperature increase, the increase on the Celsius scale is only by 0.56o, while that on the Fahrenheit scale is by 1o. Hence, 1o rise in the Celsius scale is greater than the 1o rise on the Fahrenheit scale. Can a clinical thermometer be used to measure the temperature of boiling water? Why? A clinical thermometer has the temperature range from 35oC to 42oC. But the boiling point of water is 100oC. Therefore, it is not possible to measure the temperature of boiling water with a clinical thermometer, as it can break outside its range of temperature. Why is a laboratory thermometer not used to measure body temperature? A laboratory thermometer is designed to measure high temperature ranges; therefore, the divisions marked in between the degrees are not equal to that of a clinical thermometer which is specifically designed for measuring small temperature ranges. The divisions marked on a clinical thermometer are accurate to measure the body temperature perfectly. You have seen that an ordinary glass tumbler can crack if very hot or very cold water is poured into it.You have two glass tumblers made of ordinary glass−one with thick walls and the other with very thin walls. Which one is more likely ot crack when very hot or very cold water is poured into them? A thick walled tumbler will crack more easily than a thin walled tumbler when extremely hot or cold water is poured into them.This is because in a thick walled glass, it's outer wall will be less affected by the extreme temperature as compared to its inner wall. The inner wall will expand or contract easily, while the outer wall will remain unaffected causing the glass to break. But in a thin glass, both the inner and the outer will wall react to the high or low temperature and expand or contract almost at the same time. Hence, it is less likely to crack.